“256² ” is an intervention in Public Space. In this temporary piece the outline of the virtual NewBerlin in Second Life was marked by Aram Bartholl in physical space at Alexanderplatz Berlin, 15.03.2007. Jan Northoff and Tobias Neisecke from YOUseeMEin3D.com have the vision to rebuilt Berlin entirely in Second Life (they have a reservation on over 3000 Sims!). In spring 2007 they started to build the center of NewBerlin in Second Life. The TV tower at Alexanderplatz is right in the middle of the first Sim. Sim (Simulator) is the land unit of Second Life with a size of 256 x 256 meter in virtual space. But a Sim ist not just a square surface in virtual space. In terms of software and hardware each Sim is a seperate instance. One Sim and all action on this Sim is hosted by one server. Also the billing model of Linden Labs, the company who is running Second Life is based on that unit. The owner of a Sim in Second Life is in control of many functions and properties of that “land”: When is night- and when is daylight? May any visitors of that sim create objects? Will these objects stay on that sim? Is health/damage activated? (Avatars can die)… and many more options. 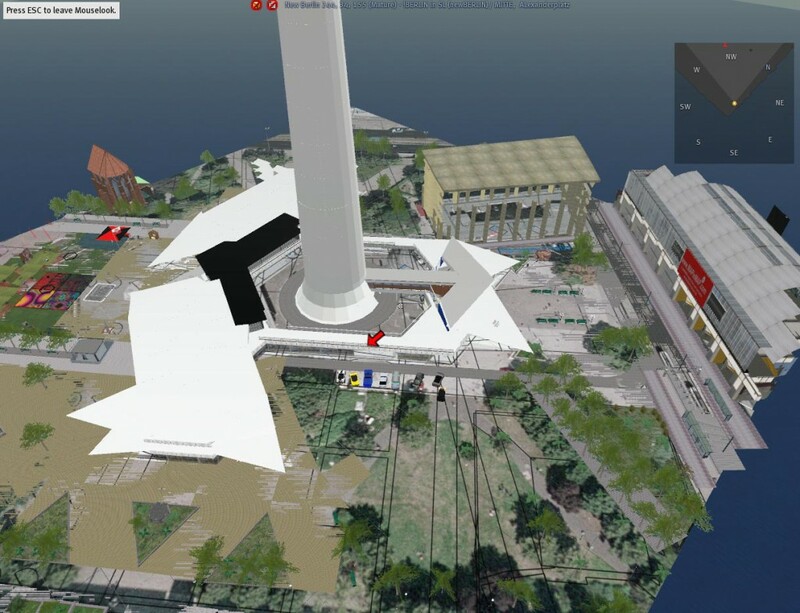 The idea of the public intervention “256² ” was to make the first Sim of Second Life’s NewBerlin visible in real life Public Space at Alexanderplatz Berlin. Equiped with 64 pieces of plain chalk ( 1piece of chalk = 16 m, 64 pieces = 1024 m ) Aram Bartholl drew the outline of this 256 x 256 meter square in public space. The line of chalk, representing the virtual copy of Alexanderplatz crossed a McDonalds, a Church, two housing blocks, a trainstation and a mall, among other objects and surfaces. “256² ” is produced in cooperation with Jan Northoff and Tobias Neisecke from YOUseeMEin3D.com, Thanks to the team for documentation and support. Thanks to Joachim Stein for the pics. See all his pics of this intervention on flickr.